The buttons are placed well, as are the trigger buttons in back. The D-Pad feels a bit mushy and I would have preferred a standard plus (+) style like on the iCade 8-bitty, but you’ll only really notice an issue when performing “sweeping” moves, such as the ha-do-ken in Street Fighter. I’ve actually played all the way through some of my favorite games using the Gametel and playing portable games like Metroid: Zero Mission were almost as good an experience than the original GBA…mostly because smartphone screens look infinitely better then the original Game Boy screens! 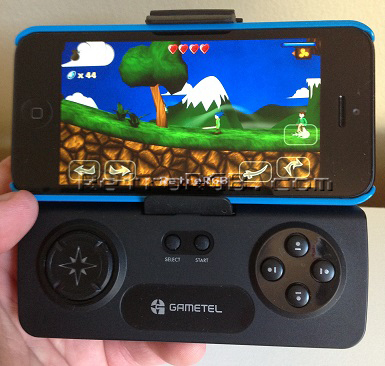 Another big advantage of the Gametel is that it has multiple modes of operation. If you turn it on while holding a specific button down, you can choose between iCade, Android and two types of PC modes! This means you can even use it with your PC or Mac! I use mine with my Mame machine and it works great. The Gametel charges via a micro-USB port on the bottom and the same port is used for firmware updated via your Mac or PC. 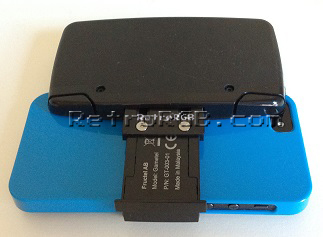 The battery life is excellent: Your phone will run out of juice long before the Gametel will! To purchase, check out the eBay links on the right –> If for some reason, no one’s selling them on eBay, you could always try Amazon.